In a year full of excellent hard rock releases, Domain has returned with their follow up to One Million Lightyears From Home. 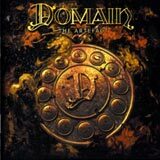 Domain plays an interesting brand of keyboard rich hard rock splashed with power metal influences from time to time. The Artefact delivers 12 songs (plus an intro) of polished melodic hard rock. The songs feature extensive use of keyboards, but they do not drench the songs or restrain the flow of the album. The drumming is tight and diverse: there are no monotonous drum beats to be found on this album. Not only is drummer Egdar Schmidt a good hard rock style drummer, but he is capable of a more "in your face" approach as well. Charade, Experience XTC, and Blackhole Visions are songs that show the most obvious power metal leanings on the album largely due to their tight, energetic drumming. The Artefact also boats some excellent guitar work. Interesting solos and strong riffs are important elements to a good hard rock album, and The Artefact will certainly feed your appetite for such guitar work. The songs are all catchy with strong chorus lines and emotional lead vocals. However, a handful of songs have a melody that leave me thinking, "Where have I heard that before?" Aside from that, Domain plays their music with inspiration and with excellent musicianship. The production is very crisp, giving the album a very polished feel. Luckily, there are no filler songs to be found and the one ballad, Strangers From The Heart is no exception. Consistency is part of the package as you can play this album from beginning to end and be assured that each songs will be as good as the rest. This album is sure to please fans of well produced melodic hard rock. Thanks to Domain, we can add another quality hard rock release to an already impressive list for 2002!